I am a big fan of finding recipes that are healthy and how do I put this delicately… don’t make me sad! With this dish, you don’t even realize your making nutritious choices because it is so delicious. I love chicken thighs because they are so fast to prepare which makes them a weeknight warrior. In this recipe, I used Blue Goose chicken thighs because they are ethically farmed and have more of a complex flavour than commercially grown chicken. It is the perfect dish to cook for National Nutrition Month. To prepare the glaze, combine all of the ingredients in a large bowl and whisk together. Set aside 1/2 cup of the glaze. Place the chicken thighs in the remaining liquid mixture. Let the chicken marinate for a half hour or up to two hours in the fridge. 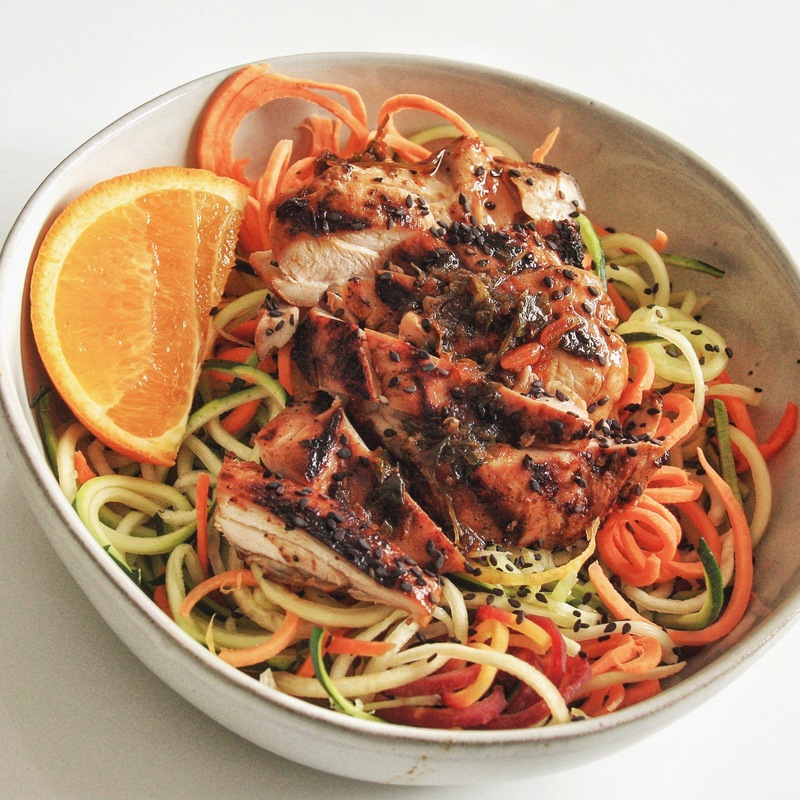 Meanwhile, using a spiralizer or a peeler, make your carrot and zucchini noodles. Pour the remaining glaze into a pot and bring to a boil. Reduce the heat to a simmer and cook until the glaze has a syrup-like consistency, 5-10 minutes. Preheat a grill pan to medium high heat. Grill the chicken for 5-6 minutes per side. Let rest for 5 minutes then slice into bite-size pieces. To assemble, divide the zoodles between two bowls. Place the sliced chicken on top and drizzle with glaze. Those leftover lemon and orange halves make for an adorable garnish. Slice into wedges and serve with your zoodles.